One of the great pleasures of experiencing music, especially genres such as pop, or - more pertinently for this review - indie folk, lies in the familiarity of its forms. Like comfort food for the ears, they follow well-established stylistic contours with often very slight variations. Yet they reliably hit emotional sweet spots that allow you to forgive, or even overlook entirely, the fact that they offer few surprises or intellectual challenges. Much the same can be said of Song One, the debut feature of writer-director Kate Barker-Froyland. As the title indicates, it's a music-themed film, so much so that it's practically a full-on musical, only lacking the leads breaking out into fully choreographed performances. The musical mode here is earnest, heartfelt, New York-based indie folk. The template for this kind of film was pretty much set by John Carney's 2006 film Once, a similarly unassuming film that charted a romance revolving around music. The main difference in Song One is that only one member of the romantic couple is a musician. And while Song One doesn't match the sublime loveliness of that earlier film, its low-keyed restraint in executing a rather contrived scenario and the naturalistic playing of its actors make it a pleasurable, if rather ephemeral and lightweight, experience. Song One begins with Henry (Ben Rosenfield) belting out a song accompanied by his acoustic guitar as he plies his trade as a subway busker. After his performance, he walks out onto the street, lost in the music playing on his headphones. As anyone who has traversed hectic New York City traffic can tell you, this is an ill-advised course of action. Sure enough, he's struck by a cab while crossing a street, ending up in the hospital in a coma. Meanwhile, Henry's sister Franny (Anne Hathaway) is far away in Morocco, researching her anthropology Ph.D. dissertation on nomadic tribes. She's called away from this by her mother (Mary Steenburgen), who informs her of her brother's accident. When Franny arrives in New York and sees her brother's condition, she's immediately distraught, her grief exacerbated by her guilt over the fact that they haven't spoken in six months. This estrangement followed an argument they had over Henry's decision to drop out of college to pursue a music career. Franny visits Henry's Brooklyn apartment, and comes across a CD of Henry's original music that he'd sent her, but she'd never bothered to listen to. She also finds Henry's personal journal, an object that will drive much of the narrative to follow. To assuage her guilt over their separation, she decides to use Henry's journal as a guide to the places and experiences he had. She also uses objects from his favorite haunts to try to revive Henry from his coma, such as bringing him pancakes from his favorite diner and placing them underneath Henry's nose, or purchasing a vintage keyboard set and attempting to play it for him. Franny also comes across memorabilia and photographs of James Forester (Johnny Flynn), a folk musician that Henry idolized. Armed with a photo Henry took with James, she seeks James out, after discovering tickets to James' gig at the Bowery Ballroom. Franny goes to the show and meets with James afterward, telling him how big a fan her brother was of him, and that he's now in coma. Though James doesn't really remember Henry, he's very sympathetic and even promises to pay Henry a visit in the hospital. Sure enough, James shows up at the hospital not too long after, guitar in hand, and sings one of Henry's favorite songs. Thereafter begins a slow and tentative, yet inevitable, romance between James and Franny. The two visit various music venues in Brooklyn and Manhattan that will be familiar to viewers conversant with the vibrant New York indie music scene. And in a way, Franny - who records street sounds along the way to play for her brother - continues her anthropological work here, discovering a world that was unknown to her, even though it was much closer to home. One of the strengths of Song One is that by not bearing down so hard on its narrative, it allows ample space to display the range of music performed in the city on any given night - indie rock, blues, electronic and more. This also allows its performers to shine in ways that a more plot-driven film wouldn't give them the opportunity to. This is most evident in Anne Hathaway's performance, in which she does wonders with gestures, and the inimitable expressions of her doe-eyed face, which convey a great deal of emotion and are quite affecting, often without recourse to dialog. 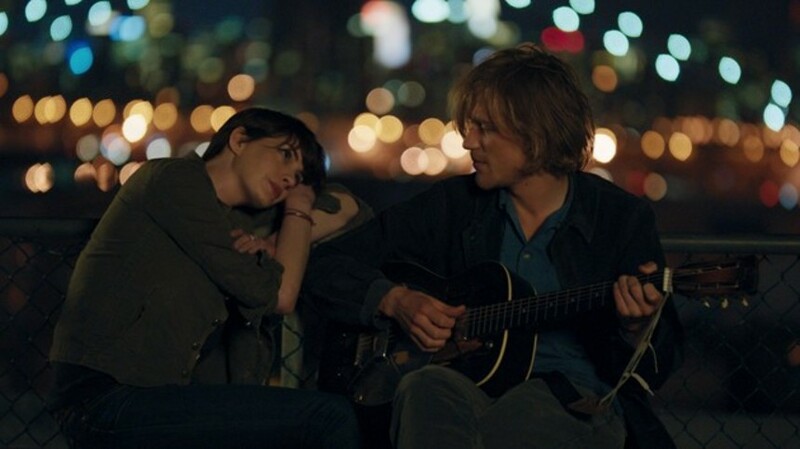 And although relative newcomer Johnny Flynn - an actor who is also a musician in real life - sometimes threatens to be overpowered by his much more famous co-star, their interactions are very nicely played. The sometimes shy and awkward nature of their relationship, which comes about from such a tragic circumstance, adds an intricate layer to the trajectory of their relations that transcends the potential minefields of clichés that surround this scenario. Mary Steenburgen is a delightful addition to the mix, regaling the couple with stories of her hedonistic days in 1970's Paris, and revealing some tensions with Franny in brief but beautifully rendered scenes. Of course, a film that's so heavily reliant on its music rises or falls on the quality of that music. And in the case of Song One, the music is quite impressive; the original songs by Jenny Lewis and Johnathan Rice help to move the narrative along as well as being very lovely in their own right. Also, the performances along the way - in actual concert venues - by such artists as Dan Deacon, Sharon Von Etten, The Felice Brothers, Naomi Shelton and the Gospel Queens, and others, nicely capture the atmosphere of the tuneful milieu the characters navigate. Song One may not be music to all viewers' ears; its wistful and emo-romantic mood may be too precious for some. And indeed, there is such a light, gossamer feel to it all that its delicate mood threatens to evaporate the moment you leave the theater. Yet it is precisely these qualities that make Song One an understated, yet visually and emotionally lovely charmer of a film. And bonus for Les Miserables (the movie) fans: you will get to hear Anne Hathaway sing a little. Song One opens in New York at the Angelika Film Center on January 23, and will also be available on VOD and iTunes. I saw the movie on Sundance 2014. A very sweet movie, Hathaway was surprisingly charming. I'm going to miss her in short hair. She pulled that off extremely well. She looks amazing with long hair and like a lunch lady with short hair.